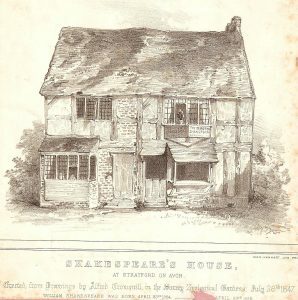 A few weeks ago at a local book fair I bought a collection of engravings of Shakespeare’s Birthplace all dating from the nineteenth century. 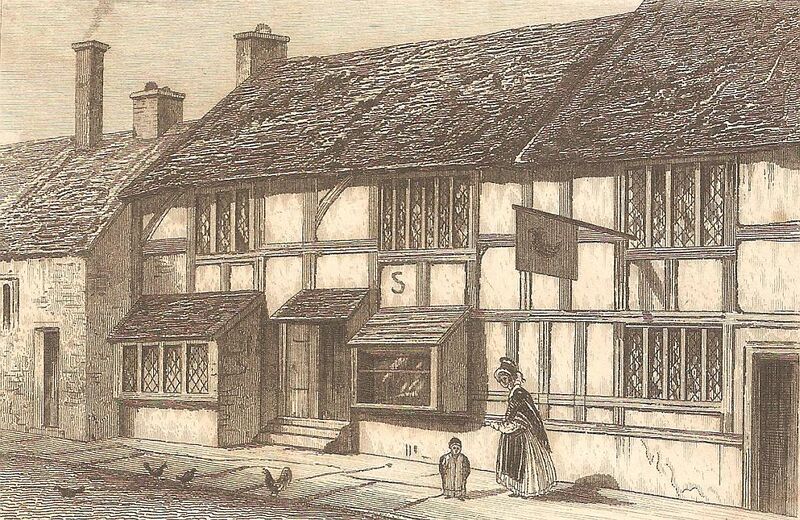 Shakespeare’s Birthplace was a major tourist attraction, and one which changed in appearance several times, the changes giving clues of the dates when the images were made. The images show how the house was transformed from being a neat, though humble little building with chickens scratching around in front of the door to the neat and prosperous-looking detached house that it became in 1864 after restoration. One of the engravings shows the house, in a sadly dilapidated condition, being shown to two ladies by a gentleman in the costume of the 1840s. He points to the sign “THE IMMORTAL SHAKESPEARE WAS BORN IN THIS HOUSE”. In an upper window a flowering pot plant can be seen, but the rest of the house is in a terrible state. The location is carefully represented, with buildings on either side and a sign for the Coach and Horses inn (now a café) across the road. Stuck on the other side of the piece of paper is an almost-identical image of the same building, but this one is labelled “Erected from Drawings by Alfred Crowquill, in the Surrey Zoological Gardens, July 26th 1847.” So what was this about? She continues, “as far as replicas went, this was certainly impressive. In many ways it was better than the actual Birthplace. For one thing, it was closer to London, and it also came with a complete interior and furnishings, in contrast to the dilapidated condition of the Stratford house. The two properties were identical.” The Illustrated London News confirmed “Nothing can exceed the minuteness of the copy…right down to the blackened and worm-eaten timbers and the broken paving stones outside the front door”. It was apparently the most successful attraction that had ever been shown at the Zoological Gardens, which were in Newington, on the east side of Kennington Park Road. The copy drew crowds because the original house in Stratford was to be sold, an event that was causing enormous public interest in the press. 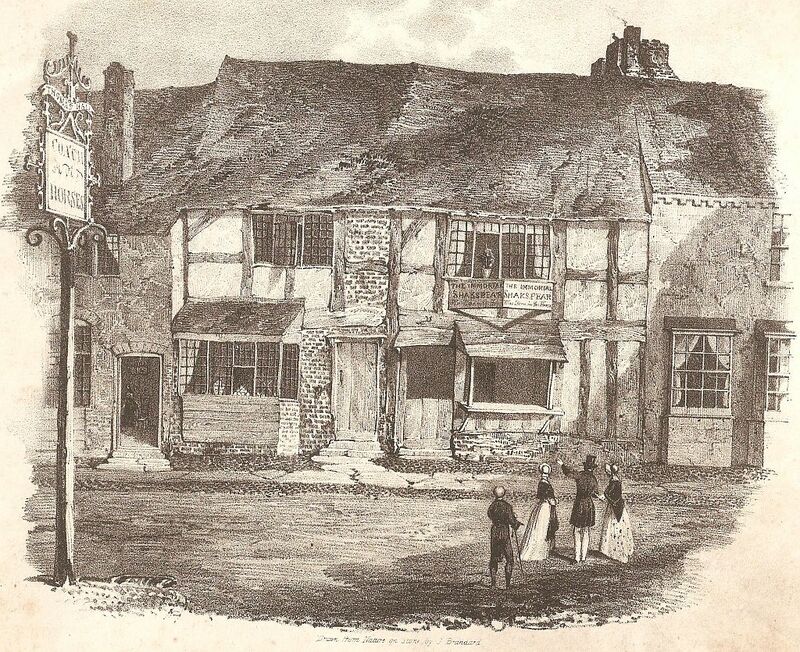 She reckons that “The Shakespeare industry that we recognise today, the economy that has transformed Stratford into a tourist mecca…was a direct result of the auction of 1847”. Souvenirs of the sale process, even copies of the Auction Catalogue, were sold and collected in large numbers. It’s strange to think that, if American circus-owner Mr Barnum had bought the Birthplace and shipped it off to the USA as he was rumoured to be planning, England would have been left with the Surrey copy to take its place and Stratford would never have become that tourist mecca. The history of replica buildings is certainly strange, with the modern Shakespeare’s Globe in London being the most obvious example, though this at least was built only a few hundred yards from the location of the original. There are replica Globe Theatres all over the world, but just at the moment a “Pop-up Globe” is in full swing in Auckland, New Zealand. It claims to be the world’s first temporary working replica of the second Globe, and its second successful season full swing. The three-storey building this year has a new hand-painted ceiling and large stage, and until 19 May 2017 is staging Much Ado About Nothing, Henry V, Othello and As You Like It. I have to confess I’m not sure how this initiative relates to the well-established Shakespeare Globe Centre New Zealand, which has for over twenty years worked with Shakespeare’s Globe under the leadership of Dawn Sanders. This group became well-known for their educational work and for the donation of a set of classically-inspired embroidered hangings made in New Zealand for Shakespeare’s Globe, and which now hang in the exhibition in the UnderGlobe. Unlike the copies of the theatres themselves, these are original work as no records have survived of the original Theatres, but how extraordinary it is that New Zealand should have such a powerful record of involvement in Shakespeare’s Globe theatres. This entry was posted in Legacy and tagged Alfred Crowquill, authentic, Dawn Sanders, Julia Thomas, New Zealand, pop-up Globe, replica, Shakespeare Globe Centre New Zealand, Shakespeare's Birthplace, Shakespeare's Globe, Surrey Zoological Gardens. Bookmark the permalink.